Oh my goodness, where do I even start with this session. First of all, the forecast was playing major tricks on us all week, so I’m still in awe at the fact that we ended up with literally PERFECT conditions. It kept claiming we’d have thunderstorms all afternoon, but when the day finally came we were met with amazing 40mph winds (with gusts over 50! ), gorgeous clouds, and some of the most epic light I’ve seen. On top of that, Alex chose some of the most perfect dresses AND had a bouquet + flower crown made that matched the canyon beautifully. Can we make bouquets and flower crowns a thing for all engagement sessions? I’m so for it. I will say, the Grand Canyon is one of the most amazing places we’ve ever shot, but it is not for the faint of heart. Thankfully these two were 100% in for the adventure and had no issues walking right up to the edges, climbing down and up big rocks, and doing some potentially sketchy maneuvering to get the rad photos they were psyched on. 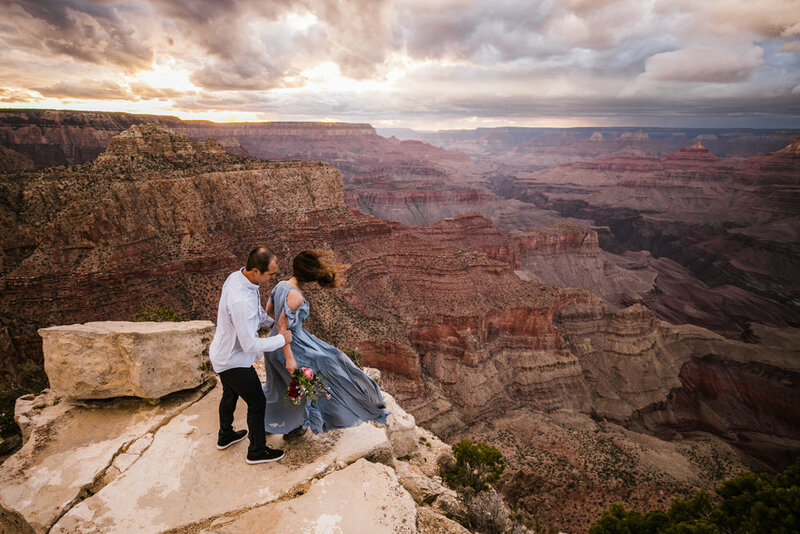 The tourists nearby looked on with amazement as Alex flawlessly scaled rocks in her long flowy dress all while maintaining perfect chill and enjoying the entire experience. 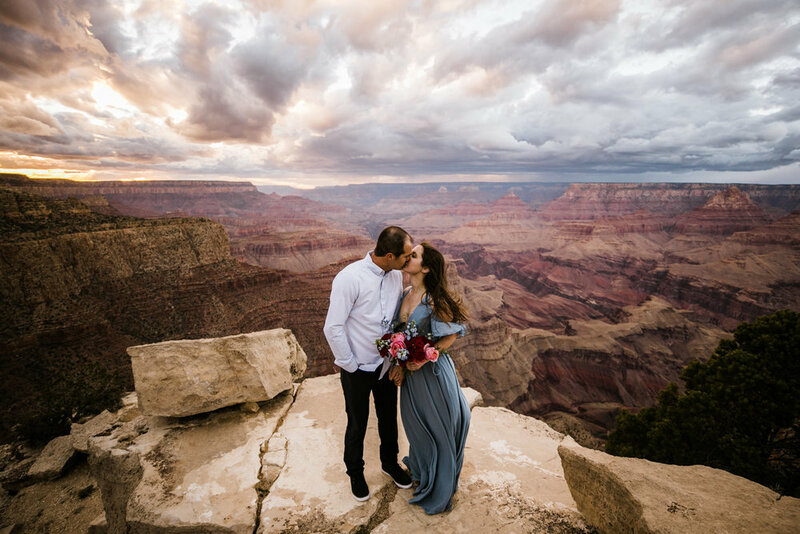 We had so much fun getting to know these two, watching the clouds run across the Grand Canyon, and embracing the wild wind. 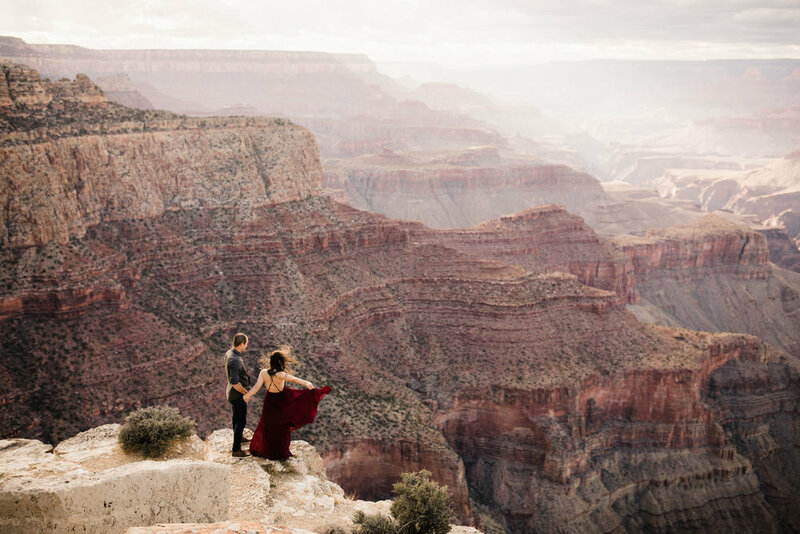 Callen and I had only been out to Grand Canyon National Park once before on the tail end of a huge road trip, so this visit kind of blew our minds. We realized how easy it is to get away from crowds, even on a busy weekend in the spring, and fell in love with the sweeping views and wild weather. It was amazing. 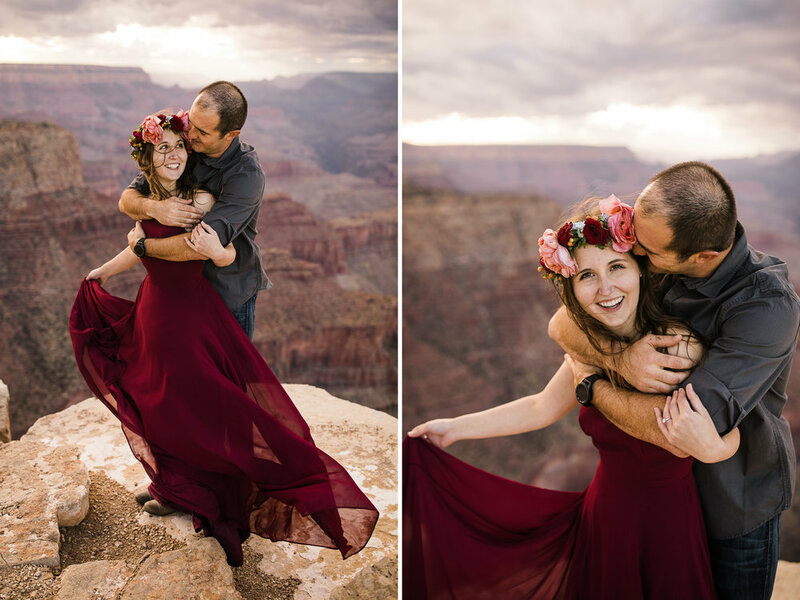 We are definitely hoping to book more engagement sessions and elopements in the Grand Canyon in the future! Their session ended with some gorgeous golden light peeking through the clouds, more wild wind whipping Alex’s dress and hair in the most epic way, and an amazingly colorful sunset. Not soon after we hugged goodbye and hit the road toward Utah, it began pouring down rain and we saw the storm that had been forecasted for the afternoon. We were so thankful it held off for us! These photos are some of the most epic engagements we’ve done, I seriously can’t get over the amazing weather and how perfectly Alex’s colors went with the environment. If you’re considering an adventure engagement session with us, I hope this is some major inspiration for what’s possible! And if you already have one in the works — I’d consider planning your outfits to match the environment, and maybe even getting some florals made! 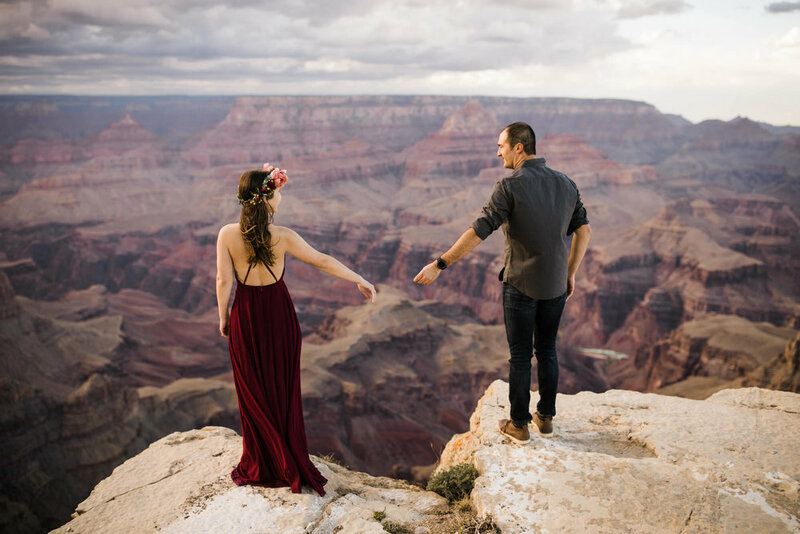 They seriously added so much to this amazing Grand Canyon National Park engagement session!